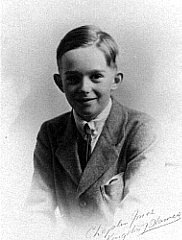 Henry Morrice Stanley Man was born on 23 February 1925 in Hamburg, Germany, the youngest son of Harry Morgan Stoe and Nora (Loeck) Man. Henry married Alice S____h on 27 September 1980 in Johannesburg, South Africa. He died on 24 November 1999 in Frankfurt, Germany. Alice was born on 28 December 1949 in Pretoria, South Africa. Henry and Alice belong to Generation Seven; their son belongs to Generation and is living.